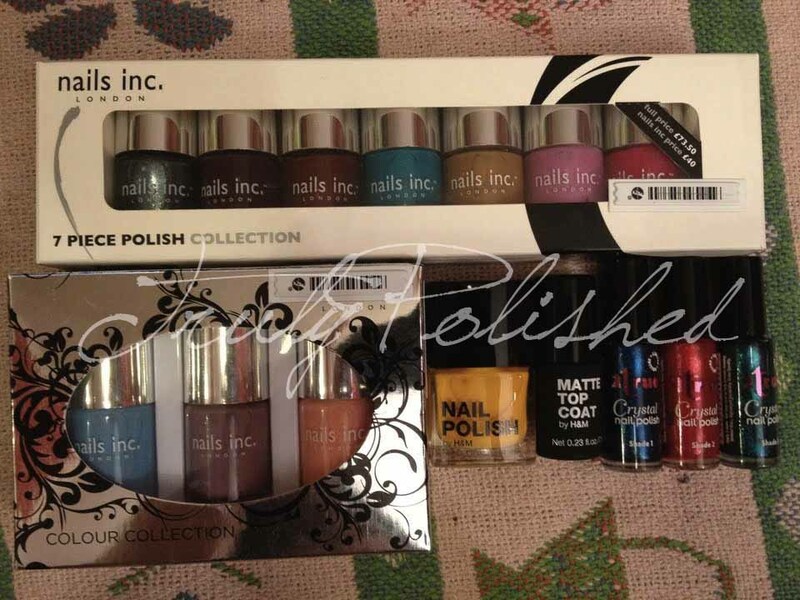 This means I haven't got a polish to show you, but I do have a little haul post! I bought some Nails Inc last week from TKMaxx, if you haven't been into your local store lately, have a look, they've got a ton of Barielle, Nails Inc, Color Club and Barielle in there at the moment! This week I bought a few 2true limited edition shades and a couple of polishes from H&M too. So here you go! I'm so sorry for the photo quality, the photo was taken with my boyfriend's iPhone. My camera is currently plugged into the laptop scanning for lost photos! I've swatched a couple of the Nails Inc polishes already and posted them but I still have a lot to do as you can see! I also can't wait to wear the yellow polish. I've been looking for a mustardy yellow colour for a while and Lemon Tree from H&M was perfect! And it was only £2.99! The 2true polishes I bought were so cheap, I think I got three for £4.00 or something and I'm really pleased with them. I'll be swatching them soon if my camera ever decides to like me! I bought the matte topcoat because I've wanted to get one for a while. I keep seeing really cool looking nail art designs online combining matte and glossy polishes and I've wanted to try it out. 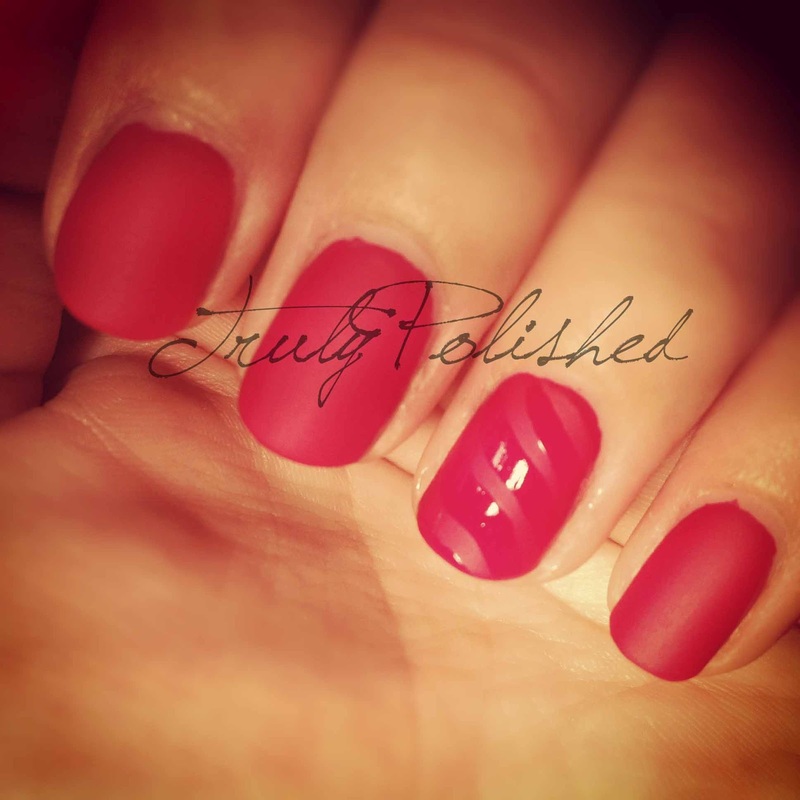 I thought tonight would be a good time and so I used Nails Inc Park Walk which is a very bright pink. I painted it on all my nails (it was almost opaque at one coat - perfect at two) then added the matte topcoat. Once I was happy with it, I used NYC Colors In a New York Minute Grand Central Station (a clear topcoat) to paint on curved stripes on my chosen accent nail - my ring finger. I was so pleased with this! Here's a photo, this was taken on Instagram with my iPad, so the colour is a bit off! I'm really hopeful that tomorrow I'll have a pretty polish to show you with proper photos, so fingers crossed that my camera works properly again as of then! On a side note, I'm up to 26 followers now, so only four away from my giveaway! Matte/Gloss are such fun manis! Thanks, I'm dying to do this giveaway! I've had it set up for about 6 weeks! This is my first matte/gloss mani and I'm hooked! I can't wait to get back home to my Konad kit, I can sense a lot more of these coming up!